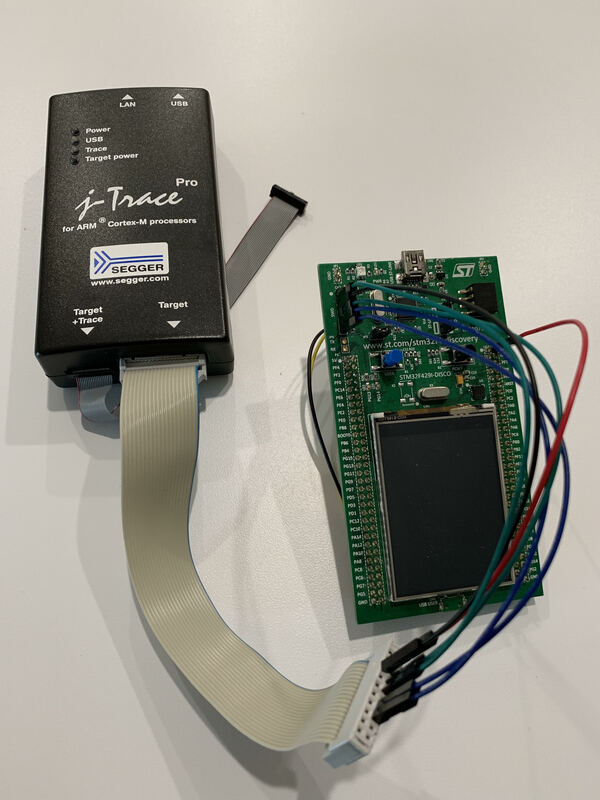 One day while I was talking with Aaron Bauch, the U.S. East Coast FAE for IAR, he mentioned how he created a board to adapt his I-Jet programmers JTAG/SWD connection to the 6-pin, single row connection that ST Microelectronics puts on most of their boards. I thought this was a great idea but unfortunately Aaron was not able to share his board or design. So in this post, I will walk you through how you can create your own adapter. The first step in the process was to pick a development board that has the 6-pin connector on it. I happen to be using a STM32F429I-Disco board in several of my courses so this board was a prime candidate. Since this adapter board is very simple and nothing more than routing tracing from one set of pins to the next, I decided to fire up Altium and create a SWDAdapter project with a single schematic sheet. From a quick look through this table do you notice any problems? I’ll give you a hint, look at pin 1 …. it’s VDD_Target, that is the VDD from the application. This pin is NOT providing the target power for a programmer to detect but instead acting as the sense line for the built-in ST-Link! This means that these pins were actually designed to program parts not on the development board! If we are going to create an external programmer adapter, the adapter is also going to need a way to sense the microcontroller voltage. Since VCC isn’t on the 6-pin connector, I decided I would add another two-pin connector to the adapter. This would provide me with an unused pin and then also a way to jumper the MCU VCC to the external programmer. Not an ideal solution but far cleaner than jumping 6 wires. 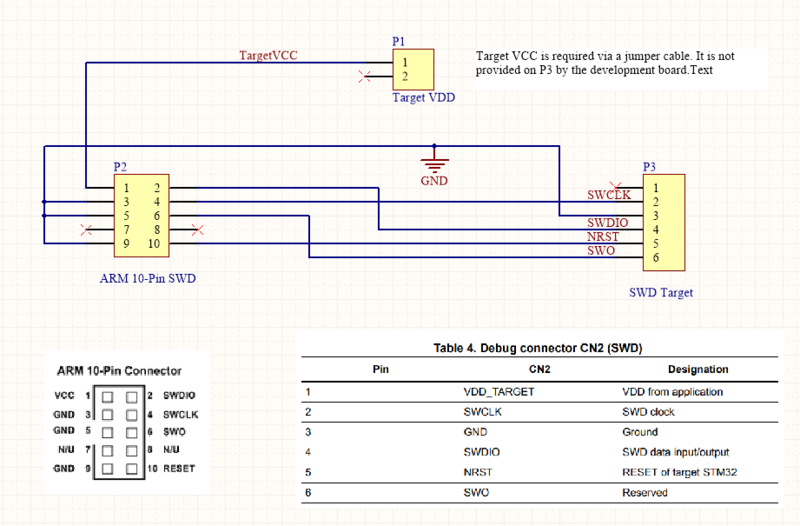 In order to make sure that I did not forget the pin-outs or that pin 1 would be unused, I copied the pin-out table and pasted it onto my schematic sheet. At this point, the only investigation left was to figure out the pin-outs on my J-Trace Pro for ARM Cortex-M processors. I found the datasheet for the programmer and then added a 2×5 standard .100 connector to my schematic and again pasted a copy of the pin-outs. You may be wondering why I would use a 10-pin header instead of the 20-pin that is in the first image. The reason I did this is that I have a 20-pin to 10-pin adapter and using this smaller size would allow me to keep my PCB small. The result, as you can see, is nice and straight forward and easy to read. The next step is to develop the PCB and then do a little analysis on what it will cost to build these simple adapter boards. (Something that should have been done first, rather than later). Since that will take some time, we will save that for Part 2 at a later date. I was just looking for something like this, Jacob. You’re welcome! I’m planning a Part 3 once all the parts come in and I verify that it actually works. At that time I’ll also post the gerbers and files for anyone that wants to have at it! Thanks Jacob for mentioning IAR’s adapter board. It is available from IAR to enable use of the rich debug signals on the SWO line for ST’s discovery and Nucleo boards, with IAR’s C-Spy Debugger and the Timeline feature. Contact your local IAR salesperson, the part number is ADA-MIPI20-STSWD6. Thanks for letting us know! When we talked last I didn’t realize that it was something I could purchase from IAR otherwise I would have done so!